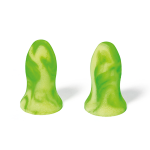 The new Moldex Contours earplugs have an anatomical shape that adapts to the ear canal for an individual fit. Moldex Contours unique curved design provides exceptional comfort. The contours follow the shape of the ear canal which means less pressure at the smallest diameter of the earplug. Contours innovative undercut design affords a secure fit, all day long. The large base helps provide proper insertion, fit, and removal.